The Power Lies in Your Hands. Enter a realm where the fate of your friends and family lie within a deck of cards. Strategically select your cards as you face off against wizards and witches as you rise to avenge the deaths of loved ones! A successful battle requires quick decisive action as you decide which monster cards will overpower the opponents. Fire elements are defeated by water elements, which are in turn defeated by leaf elements. A mastery of this system will aid you in your quest towards victory! 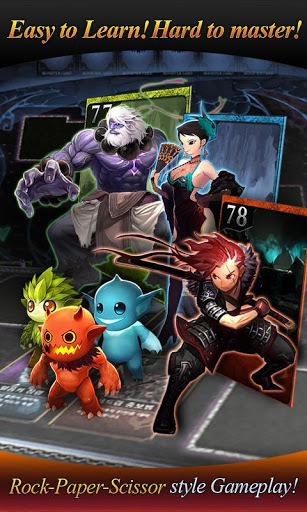 Make smart moves as your choose which monster card is best fit for the fight! 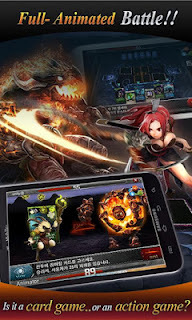 Battle other gamers and their avatars from all over the world in Multiplayer Mode! Collect and upgrade a wide array of monster cards; use item cards to aid you in battle! Watch the cards come alive as they go face to face in action! If you like strategy and RPG titles, try these games! AREL WARS 2- The Ultimate Defense Game Returns! Fighter City- Train to be the strongest in your city!